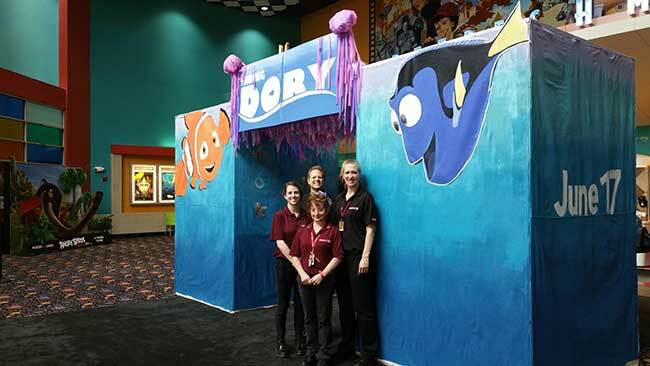 Pixar's long-awaited Finding Dory, the next chapter to Finding Nemo, officially opens June 17th, but fans at the Eastern Shore Premiere in Spanish Ft. can experience a special treat now. The new lobby display for Finding Dory stands 9' tall and 6' wide on each side. After being greeted by Dory and Nemo, guests then walk through the simulated "underwater grotto" and experience dozens of Jellyfish overhead, without the sting of course. The imaginative display was the creation of facility Director Dan Lunquist, his talented wife Lori, and cast members Paige Leeper, Jacob Williams and Rosanne Russo. Movie goers can buy advance tickets at www.pccmovies.com, by clicking on the theatre of their choice and selecting the date and show time.